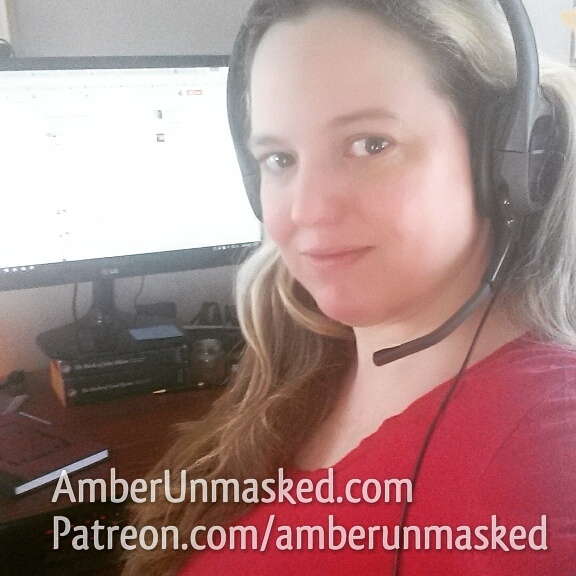 AMBER LOVE 08-MAR-2016 I started to follow some Native American authors and activists within the past year on Twitter. When it was announced that the new Fantastical Beasts & Where to Find Them would include North America, I was so excited – until I started reading the tweets of the oppressed indigenous people we’ve nearly destroyed completely. Trust me. I want American Potter style wizards and witches. I want to lose myself in that world again despite not loving all the books. It’s fiction and more importantly fantasy. It is however, historical fantasy in that it uses real folklores, old herbal cures, and all sorts of divination still used by practicing witches today. To build up to Fantastical Beasts, Rowling is slowly posting short stories on Pottermore. I couldn’t be mad at Rowling for calling boys “wizards” and girls “witches” when all of today’s practitioners use “witch” as an all-gender title though we do often use “High Priest” and “High Priestess” which unfortunately relies on the binary. God and Goddess does also, yet there’s a lot of acknowledgement that some deities and angel hierarchies are fluid or without gender at all. Rowling isn’t perfect. She’s an author. A regular person who writes and passes along fictional stories. She’s one of the more iconic female role models because of her rise to stardom through struggles and hardships that she overcame. She gives back to her people. And, when she could’ve closed the Potter world for good at the end of the final book, she took a break and returned to give even more to her fans. She’s done more for getting kids to read than anyone in the last twenty years. In other words, I respect all the concerns, but some of the hate feels like a good ol’ fashioned American witch hunt. She’s an entertainer. She isn’t responsible for everything terrible that happened in the Americas or Europe to old ways and to non-Christians. She’s a storyteller. I cringed when I saw that she would be tackling the Native magic of our country because it’s too sensitive a subject. I also think it’s easy to get so passionate that things are misunderstood. It’s the internet. We’ve seen what happens when you say something bad about the new Ghostbusters or peeled oranges wrapped in plastic. People may have some awareness, but it’s impossible to see every single perspective until experts point things out. And by experts, I don’t mean “highly educated” – I mean people with true lived experiences. Something that Dr. Adrienne Keene noted in her article is that after the “skin walker” scene in the trailer about Magic in North America, it cuts abruptly to a scene of girls being burned at the stake. The narrator does, in fact, explain that the North American lore being covered will include the Salem Witch Trials which is probably what that imagery is about and not a connection between the Native man shown right before it. As a modern witch, I could get furious that Rowling wrote it that way, but I’m letting it pass because most people get it wrong. 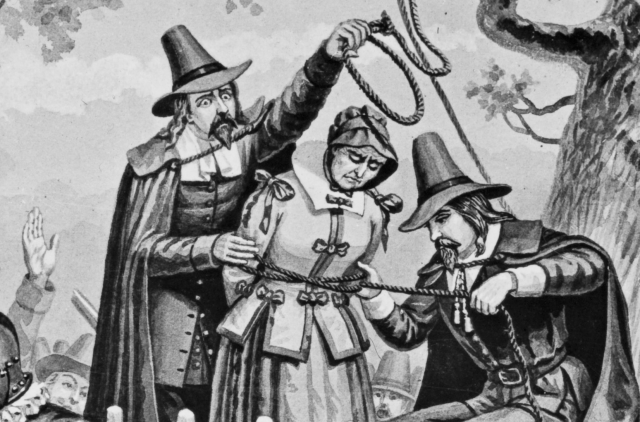 No one in America was burned as a witch. They were hanged or pressed by stones at the Salem and surrounding city trials. It’s her artistic license and yes, it will perpetuate the myth that women were burned even though it’s not true of Massachusetts history. That happened in Europe along with the most heinous methods of torture because of the Malleus Maleficarum (the book of instructions regarding torturing witches). I’m also not saying, “I’m not offended so you shouldn’t be either.” I’m saying, it’s fiction and there’s an awful lot of offensive fiction out there in books, movies, video games, and television. The best course of action may be for Rowling to hire some experts on the origins of North American history which includes First Nations speakers/authors and have them at Pottermore or with her on speaking tours or the North American premiers. Let them speak their stories and maybe find a middle ground of peace regarding what is fact and what is fiction. Taking real practices of religion and traditions and having them side-by-side with invented lore, Rowling took on a massive responsibility. I didn’t see mentions of the Inquisition, Templars, Celts, nor Catholic Church in the series so far. I see the indigenous cultures touched upon and a mention of Puritan history in Salem which is misrepresented. Like everything that headlines in sensitive issues, we have a certain amount of waiting to do except for the short stories and trailers posted already. 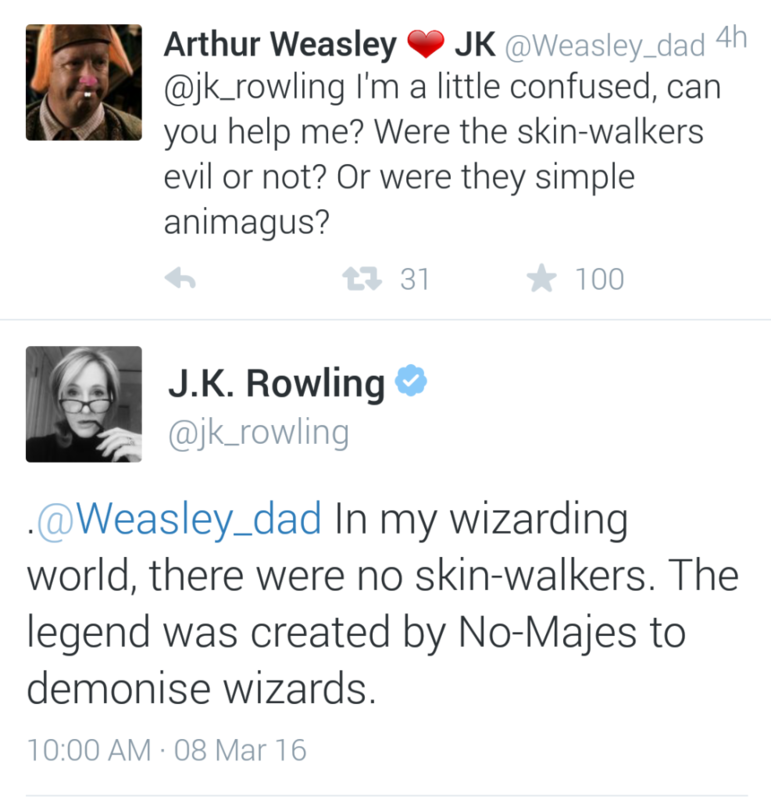 Rowling answered a fan about the skin walkers and it’s not good. She erases them entirely saying they’re a myth within her myths. Not good, JK. For the most part much of the Potter series stayed strictly in Folklore styles of Witches. More of Merlin then of Diana. By moving into Native American territory you run a much greater risk of running into sacred space. She’s done a fairly good job at staying away from deities and the like. But without the proper research and practitioners guiding her hand I can easily see her messing something up or “retelling” something and getting it offensively wrong. I honestly don’t know enough about Native beliefs to know the difference between what we’ve been taught as Folklore and what’s believed in if that makes sense?